The Ten Commandments, as given to the Children of Israel at Mount Sinai, are carefully enclosed in the Silver Pendant necklace for you to keep close to your heart at all times. The hollow glass pendant (described in Hebrew as a 'test tube') contains a small piece of genuine parchment, inscribed with the Ten Commandments - the laws given to the fledgling nation of Israel as they started their wanderings in the Desert after leaving years of slavery in Egypt. A narrow strip of sterling silver engraved with the start of the Shema Israel Prayer twists up the outside of the glass tube, offering both decoration and protection for the fragile glass. The pendent measure 3.5 cm [approximately 1.4 inch] long. 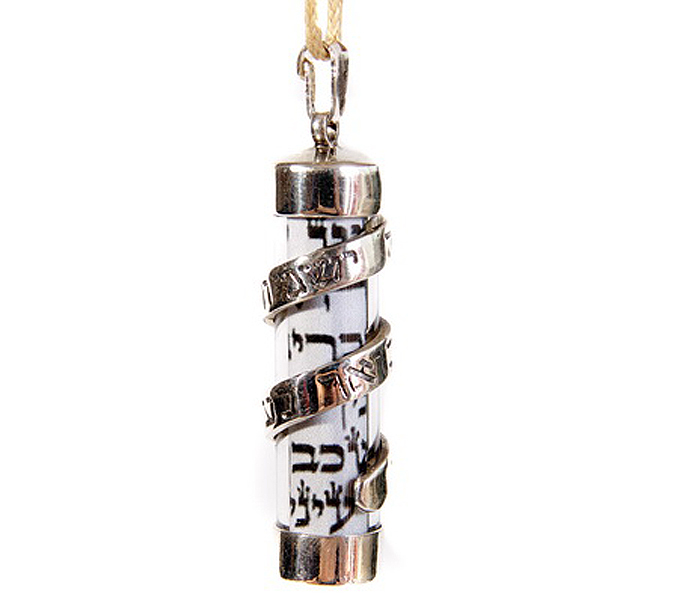 This clear glass Scriptures pendant necklace makes an unusual accessory for fans of Jewish jewelry. Wear it yourself, or give it to a beloved friend or family member. Emunah Jewelry makes a wonderful gift for anyone who appreciates Jewish jewelry in sterling silver and other fine materials. Excellent souvenirs, or presents for people who haven't yet visited Israel! All of Emunah's Jewish jewelry uses the best materials available - 925 sterling silver, 9/14/18 karat gold, pewter, and precious and semiprecious stones. Each piece is stamped with the company's ID to ensure quality and prevent imitations. All Emunah jewelry comes with a warrantee.